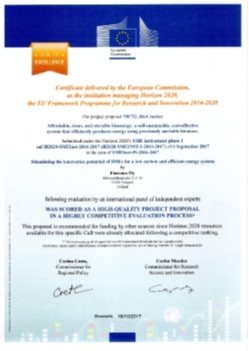 Finrenes Oy has received Horizon 2020 seal of excellence. system that efficiently produces energy using previously unviable biomass. This proposal is recommended for funding by other sources since Horizon 2020 resources available for this specific Call were already allocated following a competitive ranking. * This means passing all stringent Horizon 2020 assessment thresholds for the 3 award criteria (excellence, impact, quality and efficiency of implementation) required to receive funding from the EU budget Horizon 2020.